← DO YOU BELIEVE IN SACRAMENTAL GRACE? WHERE OH WHERE WAS THE VOICE OF THE HOLY SPIRIT IN THE CHICAGO APPOINTMENT? Will Chicago get a red hat before Los Angeles? The following comes from a Sept. 30 story by Sandro Magister on La Chiesa, part of La Repubblica newspaper website. While still reeling from the news of the imminent removal of Cardinal Raymond Burke, the more conservative and traditional Catholicism of the United States – and historically the more “papist” – has been dealt another blow with the appointment of the new archbishop of Chicago. Francis’ selection of Blase Cupich as the new pastor of the third-ranking diocese in the U.S. has plunged this particularly dynamic component of American Catholicism into a profound depression, almost to the edge of a nervous breakdown. It is enough to scan the reactions of the websites and bloggers of this area to grasp the embarrassment and disappointment over the appointment. George has always been highly critical of the secular tendency in the legislative field established under the presidency of Barack Obama, whom he has known well since he was a senator for Illinois. But it is difficult to imagine that his prophecy will come true, at least for his immediate successor. In order to understand this, it is enough to peruse even briefly the ecclesiastical career of the new archbishop of Chicago. Cupich, 65, is not originally from Chicago, like George, but from Omaha, in the outlying rural state of Nebraska. Conservative Catholics also remember that during the clash between the bishops of the United States and the White House over health care reform, Cupich was one of the very few prelates, fewer than a dozen, who said not even one word against it, even though the criticism of Obamacare was not a position of some “extremist” bishops or “culture warriors,” as they are often called in a disparaging sense, but the official position of the episcopate. After being made bishop of Spokane in 2010, the following year Cupich prohibited his priests and deacons from taking part in prayers in front of abortion clinics. A ban in stark contrast with the “mainstream” of the Church in the United States. The Rosary is in fact recited in front of these clinics in almost all the dioceses of the United States. And dozens of bishops participate in them, including, for example, the “moderate” cardinal of Washington, Donald Wuerl, and the current president of the episcopal conference, Louisville archbishop Joseph Kurtz. Cupich’s voice – as noted both by conservative Catholics, with distress, and by progressives, with satisfaction – always rings out loud and clear when the talk is of immigration or the death penalty, but he seems to get laryngitis every time there is a discussion of abortion, euthanasia, and religious freedom, or criticism of the Obama administration over health care reform. Significant in this regard is the fact that Cupich decided to expand the scope of the Respect Life office in the diocese of Spokane, to give the fight against the death penalty the same weight as the fight against abortion. So Cupich seems to be bringing Chicago back to the heyday of Cardinal Joseph Bernardin, George’s predecessor, a champion of “liberal” Catholicism in the United States and the creator of the mountainous bureaucratic machine of the episcopal conference, of which he was president from 1974 to 1977 and “dominus” until his death in 1996. And the Bernardin era seems to be coming back thanks to a move of Pope Francis, who has taken by surprise and wrongfooted an episcopate, like that of the United States, today widely characterized by appointments made by John Paul II and Benedict XVI. That it was a surprise can be noted from the fact that a few days before the appointment the newspaper Our Sunday Visitor, the most official of the American Catholic periodicals – its president is the journalist Greg Erlandson, a member of the commission for the reorganization of the Vatican media that met in Rome for the first time last week – in listing eight names of possible successors to Cardinal George did not present the one selected by pope Jorge Mario Bergoglio, that of Cupich. The fact that the appointment wrongfooted the U.S. episcopate is evident from the results of the elections of the current president and vice-president of the episcopal conference that were held less than a year ago, in November of 2013. At that electoral cycle, in fact, the ten candidates included Cupich. And his was considered by his colleagues the most distinctly “progressive,” ecclesiasticaly speaking, of the candidacies presented. So then, at the first round of voting, which saw the immediate election as president of the outgoing vice-president, Archbishop Kurtz, with 125 votes out of 236, Cupich was back in seventh place with only 10 votes. More ballots went to Houston cardinal Daniel DiNardo (25), Philadelphia archbishop Chaput (20), archbishop of Los Angeles José Gomez and of Baltimore William Lori (15 votes each), and New Orleans archbishop Gregory Aymond (14). In the two rounds of voting for the vice-presidency, Cupich was far from being elected, coming in fifth (out of nine) both at the first round, with 24 votes out of 236, and at the second, with 17 votes out of 235. For Chicago, then, Pope Francis did not take the outlook of the local episcopate into account, unlike for example what he did in Spain, where in Madrid he promoted Carlos Osoro Sierra, who as archbishop of Valencia was elected vice-president of the episcopal conference in the first round last March, with 46 votes out of 79. Nor does it seem that the pope took account of the recommendations of Cardinal George, who is believed to have asked for a priest of his diocese as coadjutor. Unlike what happened in Sydney, where instead on September 18 Francis appointed the Dominican Anthony Colin Fisher, the protégé of the outgoing archbishop, conservative cardinal George Pell, whom the pope has called to Rome as the czar of the Vatican economic-financial apparatus. There is only one point on which Francis used the same procedure in Chicago as he did in Madrid and Sydney. In all three cases he proceeded with the appointment without having it discussed first by the cardinals and bishops of the congregation for bishops, even though all of them were confirmed by him last year with significant new additions and just as significant removals (the most sensational of these being that of United States cardinal Burke). To tell the truth, it is nothing new in this pontificate for official appointments, even important ones, not to be discussed collegially by the appropriate Vatican congregation. With Benedict XVI there was no discussion over the staffing of Venice (but with Milan, Mechelen-Brussels, Santiago, and Manila there was). With this pontificate, however, procedure seems to be set aside much more frequently. The congregation was in fact not consulted to examine not only the appointments of Chicago, Sydney, and Madrid, but also, in Germany, the selection of three names to be submitted according to tradition to the chapter of Cologne, as well as all of the appointments, about twenty, for Argentina. In Italy – to give two examples – the congregation for bishops was not consulted to examine the successors for Locri and Isernia, where the promotions went to the vicars general of two churchmen in the pope’s good graces, respectively of the bishop of Cassano all’Ionio and secretary general of the episcopal conference, Nunzio Galantino, and of the archibishop of Chieti-Vasto and special secretary of the upcoming synod of bishops, Bruno Forte. Returning to the United States, at this point it will be interesting to see what will happen at the upcoming consistory for the creation of new cardinals. Currently there are three traditionally cardinalate U.S. dioceses led by an archbishop not yet with the scarlet: Chicago, Los Angeles, and Philadelphia. It is easy to guess that Pope Francis will grant the biretta to that of Chicago, the only one of the three that he has nominated. But it will be curious to see if at the same time the scarlet will go to the diocese of Los Angeles, whose ordinary is of the clergy of Opus Dei, or to that of Philadelphia (not both at once, because it seems unthinkable that pope Bergoglio would make three new U.S. cardinals in one fell swoop). Or if instead, as a further signal sent across the Atlantic, Chicago’s scarlet will be bare. Without any trim. 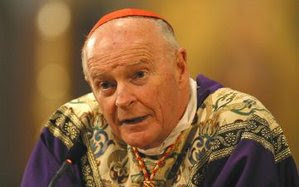 IT SHOULD BE NOTED that up to now it has been the practice of the Holy See to delay conferring the red hat on the archbishop of a cardinalational archdiocese until the retired cardinal-archbishop has died. The only exception to this rule has been the elevation of Cardinal Wuerl while his predecessor Cardinal McCarrick was and remains alive; the explanation for this exception is probably that Washington, as the Nation’s capitol, is too important to not have its Archbishop wear the red hat. In the case of Chicago, Los Angeles and Philadelphia the retired cardinal-archbishops are still alive. This entry was posted in BISHOPS, POLITICAL CORRECTNESS, POLITICAL LIFE IN AMERICA, POPE FRANCIS. Bookmark the permalink. 1 Response to WHERE OH WHERE WAS THE VOICE OF THE HOLY SPIRIT IN THE CHICAGO APPOINTMENT?